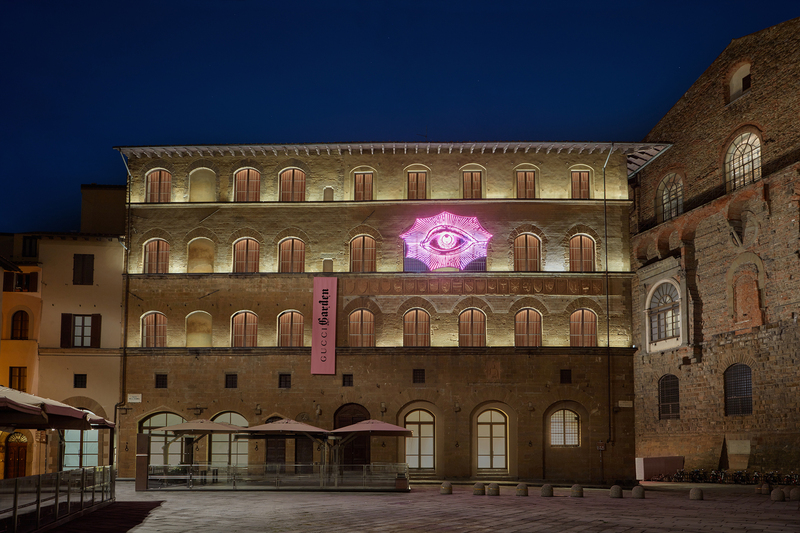 Just look for the giant neon eye that signifies Florence’s newest exhibit, the Gucci Garden, at the Palazzo della Mercanzia. Opened to the public on January 10, the Gucci Garden pays homage to the dominant fashion house’s collections from 1921 to present. The Palazzo originally housed the Gucci Museo back in 2011, and the brand thought it was a good location to open up this expansive exhibit because of its prime location (between the Uffizi and Piazza di San Firenze) and its aesthetic. Guests who visit the Gucci Garden will be able to experience the brand’s clothing, accessories, artworks, visual installations, documents and artifacts. Notable artists who work with the brand like Trevor Andrew (GucciGhost) and Jayde Fish also contributed to the Gucci Garden’s aesthetic by designing walls throughout the exhibit. “The past is very much part of the present at Gucci, which is perfectly in keeping with Alessandro’s idea of the brand, and indeed his attitude to Florence, Gucci’s home, which he sees as a city where history is vibrantly alive,” says Maria Luisa Frisa, head of the BA degree course in Fashion Design and Multimedia Arts at Iuav University in Venice. Fashion and art are not the only aspects of the Gucci Garden though. The exhibition will also have a restaurant component on the ground level, where Chef Massimo Bottura will create exquisite dishes. Bottura, who is internationally known for his three Michelin-star eatery Osteria Francescana, created a menu that features Italian fare with a few personal touches added to it. Half of each ticket sale will benefit the city of Florence to help with restorations.